TICAD is a major global economic policy forum initiated by Japan in the early 1990s with the United Nations Office of the Special Advisor on Africa, the United Nations Development Program (UNDP), and the World Bank. TICAD now plays a critical role in facilitating the implementation of African development initiatives under the dual principle of African ownership and international partnership. GHIT Fund hosted an event on the sidelines of the 2016 Tokyo International Conference on African Development (TICAD), which took place in Nairobi, Kenya on August 26. The event report by GHIT is available. 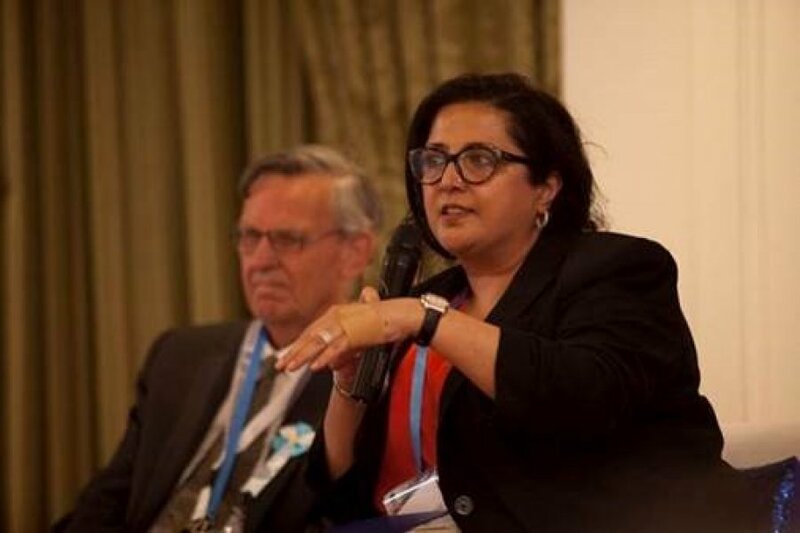 Mandeep Dhaliwal, Director of the HIV, Health, and Development group, Bureau for Policy and Programme Support at the UNDP, and Chair of the Advisory Group for the ADP answered some questions at the sidelines of TICAD VI in Nairobi, Kenya. Q: You participated in the recent Tokyo International Conference on African Development (TICAD VI): Can you tell us more about the significance of TICAD in the global health context? MD: As its name suggests, TICAD is focused on development in the African region. Led by the Government of Japan, it is also supported by co-organizers including UNDP, the World Bank and the African Union Commission (AUC). TICAD VI is significant because of its focus on global health issues. As we know, the African region faces the linked challenges of a significant disease burden, coupled with limited health systems capacities to address these problems. The region has the highest TB [tuberculosis] prevalence, with over 3 million people living with TB and 100,000 people developing multidrug-resistant TB in 2014. Almost 700 million people in Africa are at high risk of contracting malaria. 90% of all malaria-related deaths occur in this region, largely among children under five. And almost half of the one billion people in sub-Saharan Africa are at risk of at least one of these neglected tropical diseases: schistosomiasis, lymphatic filariasis, soil-transmitted helminthiases and onchocerciasis. In this context, the Nairobi Declaration adopted at the close of TICAD VI acknowledged the interlinked priorities for African development: economic transformation, resilient health systems and social stability. The recognition of the intertwined nature of development and health is very much in line with the 2030 Agenda for Sustainable Development. The Nairobi Declaration prioritized strengthening of health systems to increase African countries’ capacity to respond to public health threats: Such as Ebola virus, HIV, TB, malaria, neglected tropical diseases, other communicable and noncommunicable diseases, as well as future threats such as antimicrobial resistance. Countries have committed to strengthening institutions and building national and local capacities to address these threats as a first step. The Declaration further called for greater use of enhanced country coordination mechanisms for health system strengthening, and for research, development and innovation for addressing diseases. Q: You chair the Advisory Group of the Access and Delivery Partnership or ADP: What are the main challenges and opportunities in supporting better access to and delivery of health technologies today, and how does the ADP help? MD: The provision of health care – treatment, diagnosis and prevention – for all who need it, on time and at a reasonable cost, remains a major challenge for many countries. The reality is that the health systems in many countries are only able to reach a small segment of the population, leaving others without, or with inadequate, access to health care. With support from the Government of Japan, UNDP initiated a global partnership with the Special Programme for Research and Training in Tropical Diseases, at the World Health Organization (WHO/TDR), and Seattle-based PATH, to support countries effectively deliver new health technologies. This partnership – known as the Access and Delivery Partnership (ADP) – strengthens the capacity of low- and middle-income countries [LMICs] to effectively absorb new health technologies into national health systems. The ADP approach is based on the fact that multiple parts of a health system must work together to enable effective access to new health technologies. These essential parts include an enabling policy and regulatory framework, safety monitoring, and the selection, pricing, supply and delivery processes that must all function together in a coherent way. So, the ADP works with country stakeholders – governments, academics and civil society – to help build capacity and improve functioning of these interconnected parts of the health system. The ADP project partners have proven expertise in these different areas, and together, they assist LMICs address access and delivery challenges in an integrated way. Q: Does the ADP focus on specific diseases or health issues? MD: The ADP focuses on TB, malaria and neglected tropical diseases. There are two important reasons for this. First, the numbers of people affected by these diseases are increasing. Second, despite these sobering statistics, many of the tests and treatments for them have become outdated or ineffective. Important initiatives have started to address the need for innovation in the treatment, diagnosis and prevention of these diseases. As research and development [R&D] starts to show encouraging results, a major opportunity now exists to ensure that as new medicines, diagnostics and vaccines emerge, they reach as many people as possible. It’s a significant challenge, but in overcoming it we can transform it into an opportunity. While many of these efforts, including those by product development partnerships, focus on innovation and R&D, few look at the downstream situation. It is just as important to strengthen national health systems to ensure that new medicines, diagnostics and vaccines reach affected communities and patients. This is where the ADP works. So, we could say that the ADP focuses on promoting a coherent approach towards linking innovation with access. The Government of Japan has been particularly visionary in promoting this integrated approach. Through the funding of two complementary projects – the Global Health Innovative Technology [or ‘GHIT’] Fund, which stimulates R&D and innovation, and the ADP, which helps countries develop vital national capacities to enable sustainable introduction, adaptation and use of the new health products – the Government of Japan has encouraged useful synergies between R&D, product development, and enabling access and delivery on the ground. Q: Can you give us an example of the GHIT Fund and the ADP working side-by-side in a specific country? What makes the collaboration unique? MD: Tanzania provides a good example of the collaboration between the GHIT Fund and ADP. On the research side, the GHIT Fund is supporting the development of a paediatric formulation of praziquantel for the treatment of schistosomiasis. Also known as ‘snail fever’, this is a parasitic disease carried by fresh water snails and is one of the most widespread tropical diseases in the world after malaria, affecting more than 249 million people globally, including 100 million children. As this this new medicine undergoes clinical trials, the ADP is working with the Government of Tanzania to strengthen the capacities of national stakeholders, and the health system as a whole, to introduce new health technologies effectively. Hence, the ADP is helping to strengthen the government's large-scale campaign to distribute preventive chemotherapy for schistosomiasis. This is a vital measure, given that only 27% of the 10.8 million people in Tanzania who require such chemotherapy received it in 2014. Furthermore, the ADP works with Tanzania’s National Institute for Medical Research in helping to identify bottlenecks that hamper effective introduction and use of new health products. The ADP is also supporting the Tanzania Food and Drug Authority to set up robust safety monitoring systems for new medicines and vaccines. And another example: In Indonesia, the ADP is supporting the establishment of national pharmacovigilance systems to enable the introduction of bedaquiline, a new treatment for multidrug-resistant TB. This work is an important aspect of the overall decision-making process as the Government of Indonesia seeks to determine the wide-scale introduction of this new TB treatment. The ADP is also working on improving capacities to better plan, procure and distribute TB commodities that will help over 700 hospitals across the country deal with this major public health threat. These collaborations are unique because they demonstrate the linkages that can be made between catalyzing product development and safeguarding sustainable access and equitable delivery in LMICs. The GHIT Fund and the ADP are adopting this integrated approach to address bottlenecks within the health system. Positive health outcomes can be realized when the government and stakeholders can ‘connect the dots’ between research and development of new products and the systems for their eventual delivery to the people who need them. Q: How would you describe the contribution of the Government of Japan in global health issues? MD: The Government of Japan plays a long-established spearhead role in global health, including through prioritization of global health in its foreign policy. As far back as 2000 when the global community committed to the meeting the Millennium Development Goals (MDGs), the Kyushu-Okinawa Summit elevated infectious diseases onto the G8 agenda for the first time. Japan has maintained that leadership in this area, as was seen in the 2016 G7 Ise-shima Summit, during which the G7 countries – under Japan’s Presidency – urged for effective measures against infectious diseases, public health emergency responses and universal health coverage. The 2030 Agenda for Sustainable Development reflects the complexities of health and development today, but it is also a reflection of the global commitment towards transformative global change. In this spirit, SDG 3 has set the ambitious target of ending the epidemics of AIDS, TB, malaria and the NTDs. The Government of Japan has shown leadership and vision in exemplifying the SDG approach in its enduring global health strategy, and this is evident in its continued support for the Global Fund to Fight AIDS, TB and Malaria, for example, and for both the GHIT Fund and the ADP – where it tackles both R&D and access challenges concurrently. Q: And what is UNDP’s role within these global health efforts? MD: UNDP is proud to be partnering with the Government of Japan in drawing the linkages between these two parallel elements of the global health response. As a development agency, UNDP’s commitment to global health challenges is rooted in the principles that good health is both a driver and an outcome of development. So, building resilient health systems is a key strategy towards achieving sustainable development. To do so, understanding and meeting the priority needs of countries – and helping to address them – is of prime importance. Through the ADP, UNDP works in partnership with national stakeholders to identify national needs and priorities. This is crucial for ensuring country commitment and ownership, and hence, the sustainability of our capacity-building efforts. UNDP is committed to its continued engagement with the ADP, and to broaden the reach of the ADP.